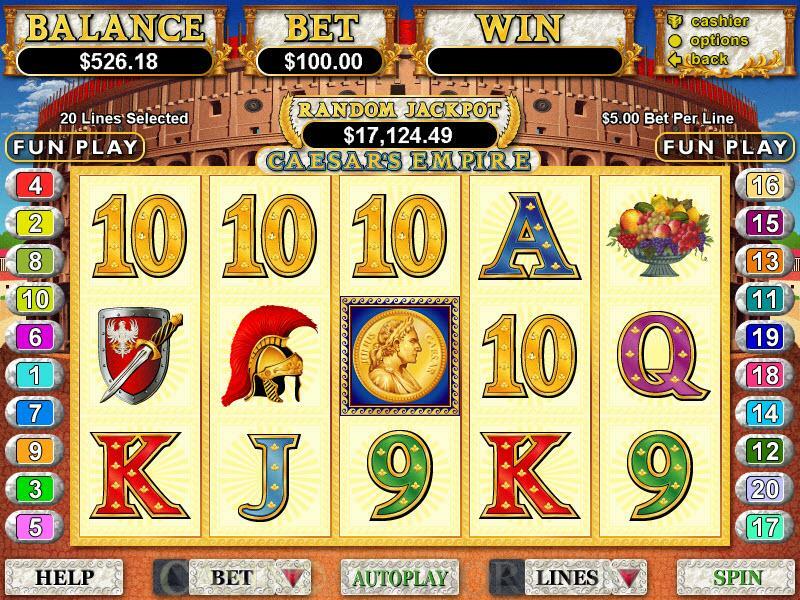 Caesar's Empire is a Real Series slot game from Real Time Gaming. Themes of ancient Greeks and Romans are quite popular and Caesar's Empire belongs to that genre. The symbols on the reels evoke the glory of Rome. The wild symbol is Caesar himself embossed on a gold coin. The scatter symbol is the Coliseum, famous for its gladiator fights. The other Caesar related symbols are Cleopatra, Helmet, Shield and Fruit Bowl. High value cards from Ten to Ace are also symbols on the reels. They have been regally crafted keeping the theme in mind. Only the Caesar symbol and Coliseum symbol show animation. In the Caesar symbol the gold coin transforms to a normal image of Caesar, with his laurel wreath crown. In the Coliseum symbol the day time transforms into night time. Both animations are accompanied by rousing military music. There is no background music in the normal spins but there is a martial tune played in the background during free spins. Players first choose the coin size. The range from 0.01 to 5.00 offers considerable flexibility. Low rollers will like the fact that all stops are available from 0.01 to 0.10. Players then choose the number of paylines they want to play. The maximum paylines in Caesar's Empire is 20. While choosing the number of paylines players must keep in mind that winning combinations pay only on enabled paylines. By default the number of coins per payline is one. Caesar is the wild symbol. It appears only on the first four reels in normal spins and triples payouts when in winning combinations. In a departure from standard practice the largest fixed jackpot without multipliers is offered by four Caesar symbols in an enabled payline. This is 2500 coins. 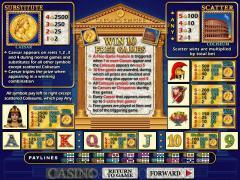 Five Cleopatra symbols in an enabled payline also offer a payout of 2500 coins. However if Caesar symbols combine with Cleopatra symbols to make a combination of five symbols then the payout is 7500 coins. The Coliseum is the scatter symbol. Two or more Coliseum symbols result in scatter payouts. Five scatter symbols anywhere on the reels offer a scatter payout of 100 coins. 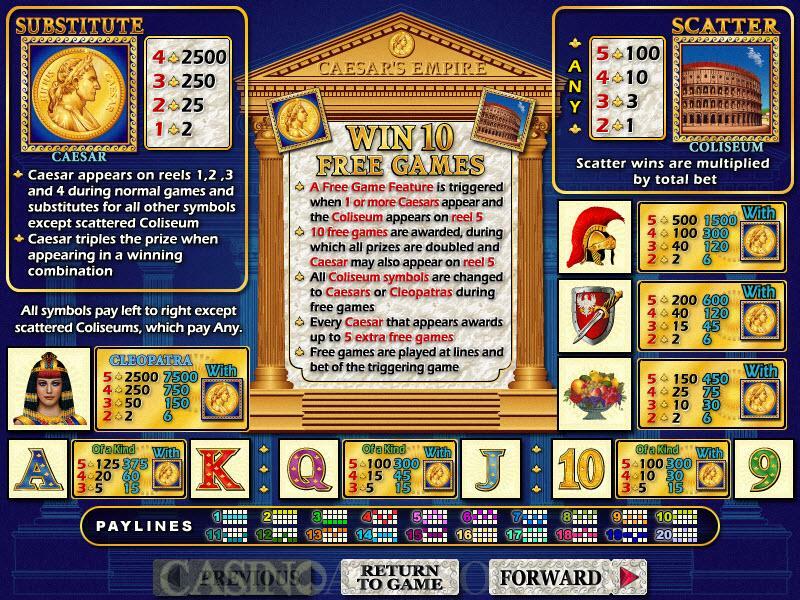 The free spins bonus round is triggered by at least one Caesar symbol in the first four reels and the Coliseum symbol in reel 5. Ten free spins are offered at doubled payouts. There are some unique features in this free spins round. The Caesar symbol appears in reel 5. The Coliseum symbol is converted to either the Caesar symbol or the Cleopatra symbol. 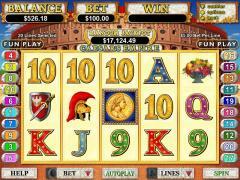 And for every Caesar symbol that appears on the reels players get up to 5 extra free spins. Because of this the free spins round runs for a long time with many extra free spins. Caesar's Empire offers a progressive jackpot. As in many other Real Time Gaming Slots this is triggered randomly without there being a specified event on the reels. Interested in reading more detailed information about Caesar's Empire? If so Click Here for more details.